Certainly, Octavius Bellamy enjoys a gold-medal smile. | Click to enlarge. On October 7, Oak Park & River Forest High School wrestling coach Octavius Bellamy was halfway around the world in Walbrzych, Poland, to participate in the UWW (United World Wrestling) Veteran World Championships. 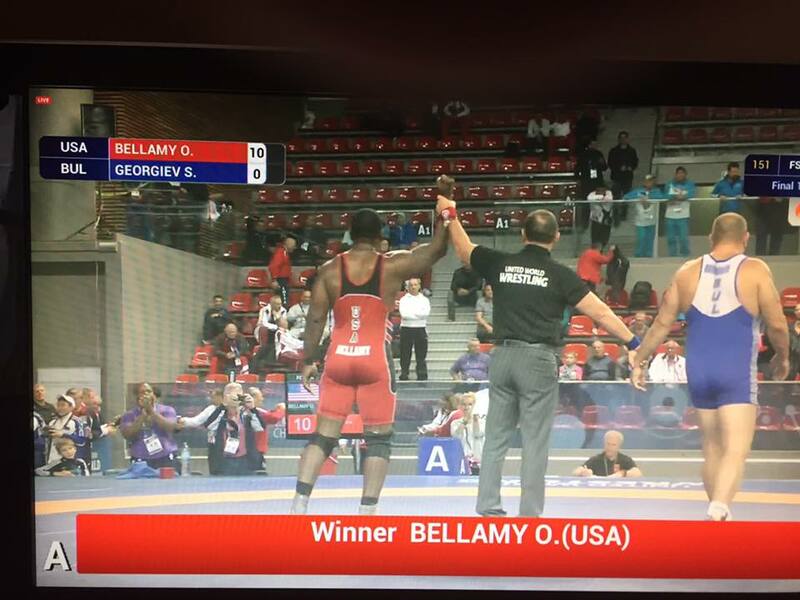 Not only did Bellamy compete, but he also won gold! 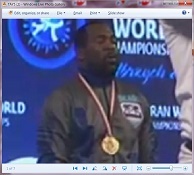 Bellamy competed in the Freestyle competition (Division B) at 97 kilograms. 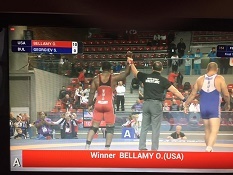 Simply put, Bellamy crushed it; he won his quarterfinal, semifinal, and final bouts by a combined score of 24-1 -- 10-0, 4-1, and 10-0, respectively. Click above photos to enlarge. Jaime Hernandez (left) and Jason Renteria (right) took to Twitter to announce their intentions. Two current seniors have made their selections for where they will continue to learn and to wrestle in one year's time. Jaime Hernandez, a two-time state place-winner (4th and 2nd), was the first to announce. On August 22, it was reported that Jaime elected to attend the University of North Carolina at Chapel Hill. Jaime told FloWrestling, "I made this decision because of the beautiful campus, the great academics, and the unbelievable coaching staff. I think the staff will help me reach my goals in both freestyle and folkstyle." For the entire FloWrestling article, click here. FloWrestling tagged Jaime as the #61 overall recruit of 2017. Jason Renteria, a three-time state finalist (one-time champion), announced his decision one week later. On August 29, Jay revealed that he will attend the University of Nebraska. In his Twitter announcement, Jason wrote, "I will be taking my athletic talents and academics to the University of Nebraska." FloWrestling also reported this decision: click here. FloWrestling pegged Jason as the number #33 overall recruit in 2017. Congratulations, gentlemen! Enjoy your senior seasons (and school years)! Fourteen wrestlers -- qualifiers among the masses who yearn to represent this country's red, white, and blue -- earned spots to participate in the 2016 Olympic Games this summer in Rio de Janeiro, Brazil. In the Men's Freestyle tournament, USA boasted six competitors: Daniel Dennis (57 kg), Frank Molinaro (65 kg), Jordan Burroughs (74 kg), J'den Cox (86 kg), Kyle Snyder (97 kg), and Tervel Dlagnev (125 kg). Snyder finished with a gold medal around his neck while Cox gathered a bronze. 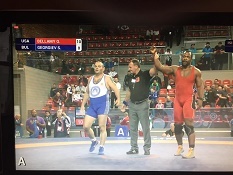 In the Men's Greco-Roman challenge, four Americans took part: Jesse Thielke (59 kg), Andy Bisek (75 kg), Ben Provisor (85 kg), and Robby Smith (130 kg). None of these four medaled. In the Women's Freestyle division, another quartet battled against the competition: Haley Augello (48 kg), Helen Maroulis (53 kg), Elena Pirozhkova (63 kg), and Adeline Gray (75 kg). Maroulis went undefeated to gain a gold medal at her weight class. While no Huskies (former or current) wrestled in Rio on the 2016 Olympic stage, this tournament is a perfect opportunity to celebrate this great sport and this great nation. As you may remember, Olympic wrestling was in danger of being eliminated from the two weeks of competition; however, after some sporting body modifications and Olympic committee considerations, wrestling continues to have a place within the five-ringed marquee event. Well, the Fargo Cadet/Junior National Championships have com and gone, and the Huskies again had several wrestlers in the fold at the Fargodome in Fargo, North Dakota. In all, eleven wrestlers represented the Orange & Blue in the Cadet and Junior divisions. Team Illinois nearly swept the points race, as the Land of Lincoln glided to victories in the Cadet Greco-Roman, Cadet Freestyle, and Junior Greco-Roman tournaments. In the Junior Freestyle championships, Illinois finished in 3rd place. OPRF earned five All-America's, headlined by Gabe Townsell's double-AA performance. 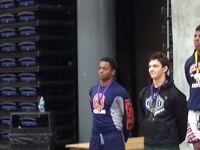 Michael Ordoñez, Jaime Hernandez, and incoming freshman Joshua Ogunsanya also medaled. 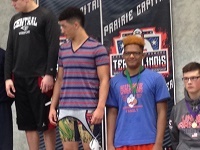 Here are the results of those upon the podium: Joshua Ogunsanya (Cadet Freestyle, 94 pounds, 4th place), Gabe Townsell (Junior Greco-Roman, 126 pounds, 2nd place; Junior Freestyle, 132 pounds, 4th place), Michael Ordoñez (Junior Greco-Roman, 152 pounds, 7th place), and Jaime Hernandez (Junior Freestyle, 138 pounds, 8th place). Other participants did not place at their respective event: Eddie Bolivar (Cadet Greco-Roman, 120 pounds; Cadet Freestyle, 120 pounds), Torry Early (Cadet Greco-Roman, 120 pounds; Cadet Freestyle, 126 pounds), Jack Fisher (Cadet Greco-Roman, 145 pounds), Ashford Hollis (Cadet Greco-Roman, 285 pounds), Elijah Osit (Cadet Freestyle, 195 pounds), Brian Holloway (Junior Greco-Roman, 160 pounds), and Drew Matticks (Junior Greco-Roman, 170 pounds). 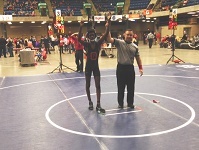 Additionally, Joshua Ogunsanya participated in the Cadet Greco-Roman, 94 pounds national tournament. What a great experience for these many wrestlers it has been. Gabe Townsell and Michael Ordoñez have now graduated, but expect the others to toe the line during the upcoming IHSA season. Congratulations to all! 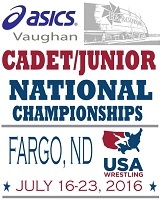 Links to the action | Here are a number of Fargo links: USAW Fargo Home | 2016 Event Schedule | IL Women's Qualifiers | IL Cadet Qualifiers | IL Junior Qualifiers | TW Cadet Women | TW Junior Women | TW Cadet Greco | TW Cadet Freestyle | TW Junior Greco | TW Junior Freestyle | Watch all bouts with paid subscription (FloPro) | Keep in mind Twitter, wrestling website previews, etc. The summer is rolling, and wrestlers from all over the USA hope to be rolling during the ASICS Vaughan Cadet/Junior National Championships. These annual tournaments will be held in Fargo, North Dakota. This year's event schedule spans from July 16-23. Jump to the official USA Wrestling Fargo Nationals event site. 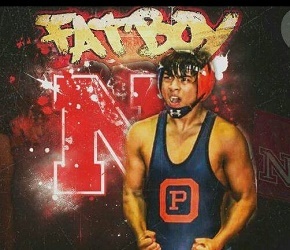 Huskies in the hunt | As we have been announcing every year, Fargo sports a litter of Huskies competing against representatives of other states. Stay tuned to the action during this extremely exciting week. We've all heard that wrestling is a 12-month sport. It doesn't have to be; for many, they come out in November to tie the laces and toe the line. Several, however, elect to add a few "wrestling miles" to the odometer of their athletic shoes' underside. Trainings and competitions have been held and will continue to be held throughout the spring and summer. Where, you ask? Well, a little bit of here, there, and everywhere. We'll update this as time goes on. Who knows, you're likely to see a number of Huskies in the mix! For a jackpot of information on these events and USA Wrestling in the state of Illinois, visit ILUSAW. Results for the Huskie Wrestling Family continue to grow. Here is a peek at some of those tallies. In addition, don't forget to follow the ILUSAW competition place-winners in the below article. 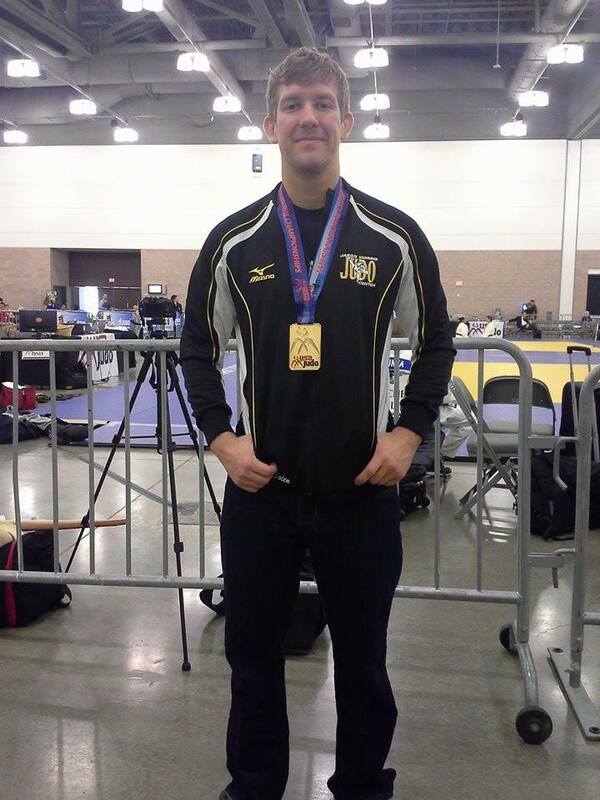 Bolen reigns again | Brad Bolen, OPRF class of 2007, secured his second consecutive Senior National Judo title at 73 kg. 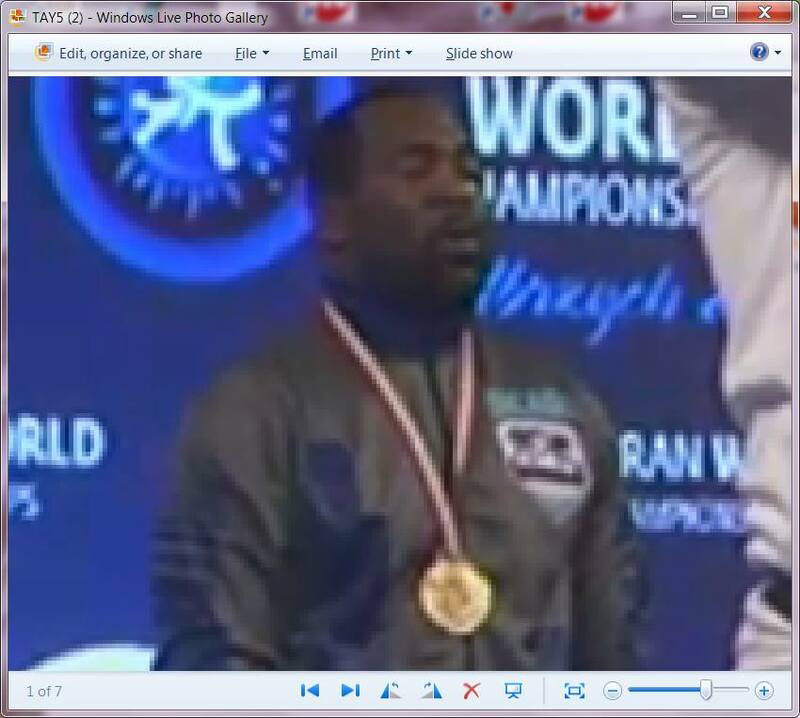 It is his fourth career Senior National Judo championship. He competed the tournament with 4 straight victories -- 2 by ippon (instant win), 1 by yuko (minor score), and 1 by submission. Brad rode his talented throws and finished with a choke submission victory. The tournament took place on April 9 in Irving, Texas. Congratulations, Brad! Jump to an article featuring Brad Bolen. 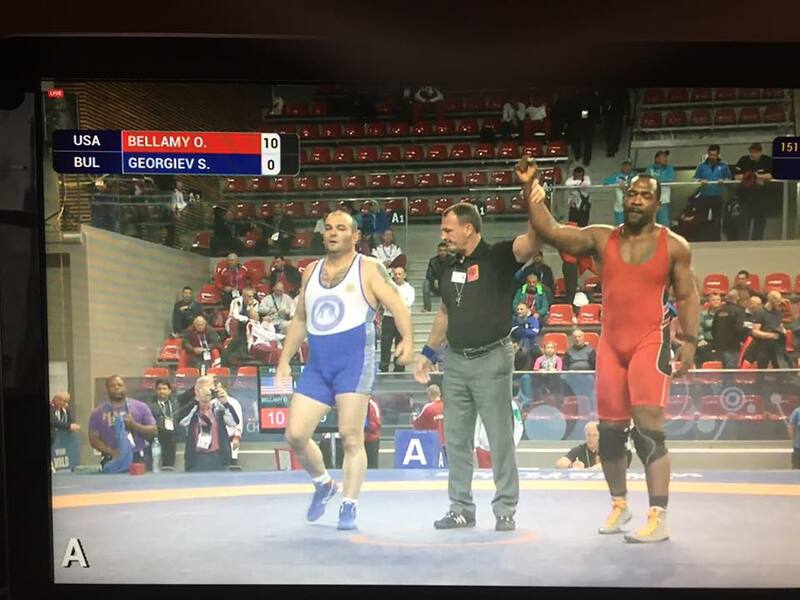 Road to Rio | Ellis Coleman, a 2009 OPRF graduate and 2012 Greco-Roman Olympian, competed and placed in the 2016 Olympic Team Trials. These trials were held in Iowa City, Iowa, on April 9 and 10. 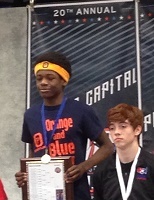 Ellis finished in 4th place in the 66 kg Greco-Roman division. Despite not earning a repeat trip to the global event, Ellis wrestled very well and represented in pure Huskie Style! Congratulations, Ellis! Jump to full tournament results on TW. Going to Town(sell) | Gabriel Townsell will be going to a new town this fall -- Stanford, California -- to continue his on-the-mat career. 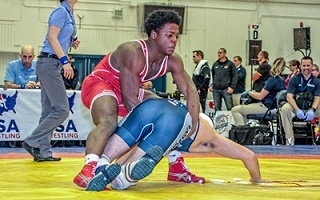 Like Kamal Bey, Gabe participated in the UWW Junior Greco-Roman World Team Championships. Gabe finished in 3rd place, completing his impressive tournament with a 10-5 decision over Isaac Jimenez (Air Force). Earlier in April -- on April 1-2 -- Gabe finished 4th nationally at the Cliff Keen Folkstyle Nationals (Junior Division, 132 pounds). Congratulations, Gabe! Even though the IHSA season is complete (and our bellies are stuffed), there is always news to report. In this edition, we look at four wrestlers who have finished their OPRF Wrestling careers. NCAA hardware | Sam Brooks, OPRF '12, wrestled in the 2016 NCAA Division I Wrestling Championships and finished atop the medal stand. 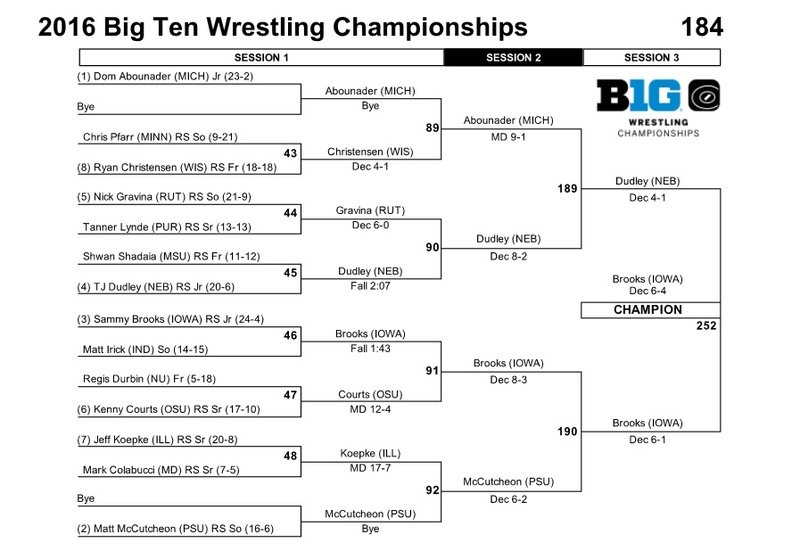 The Iowa Hawkeye finished with his first All-America status: 8th place at 184 pounds. He will prepare to ascend the ranks next season. Also wrestling -- but not placing -- were Joe Ariola (184, Buffalo) and Michael Woulfe (197, Navy). 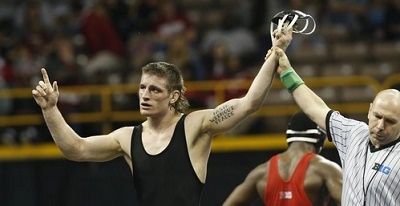 Both of these wrestlers have eligibility remaining, as well. A tremendous trio, if I ever did know one! 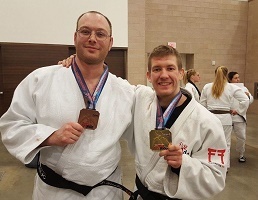 Bolen is rollin' | Brad Bolen, a judo guru, continues his successful athletic career. Brad, OPRF '07, competes with the Jason Morris Judo Center in Scotia, New York. The former Huskie was named USJA's "Most Outstanding Athlete" for 2015. Below is a recent article about Brad's goings-on. In addition to the article, you can view Brad's TeamUSA.org bio or several video clips on YouTube (2014 Senior National Finals). 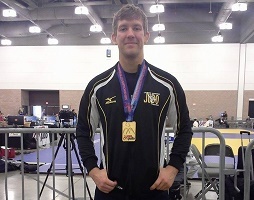 Jason Morris Judo Center athletes Brad Bolen (27) and Hannah Martin (27) both recently received United States Judo Association's (USJA) "Most Outstanding Athlete" of the year award for 2015. Bolen was named for the men winning his 3rd US National title, taking 5th at the Uruguay and El Salvador World Cups, and taking 7th at the Pan Am Games along with making his 5th World Team. Martin was the best on the women's side taking Gold at the Ocean States, 5th at the China Grand Prix, 5th in the Chile, Portugal and African World Cups, 5th at the Pan Am Games, 7th at the Mongolia Grand Prix and making her third World team. "They have put together pretty remarkable careers here." commented their coach and 4x Olympian, Jason Morris, speaking of Bolen and Martin. 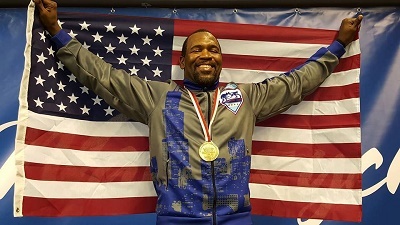 Morris who retired after his last Olympic appearance in Sydney has also been a multiple USJA award winner for "Most Outstanding Male Competitor" during his playing days. This serves as the first time Bolen and Martin have received this honor. 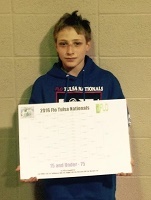 Jacob Rundell (left, at Flo Nationals) and Torry Early (at F/S State) highlight second season. The Little Huskies finished their season at the IKWF (Illinois Kids Wrestling Federation) State Championships. These championships took place on March 10-12 at the Harris Bank BMO Harris Bank Center in Rockford. In all, five Little Huskies competed in the tournament. The five were Andre Giurini (Novice 95), Jacob Rundell (Senior 79), Jake Viloria (Senior 115), Daemyen Middlebrooks (Senior 122), and Joe Chapman (Senior 130). Jacob finished as state champion! Joe finished in 6th place and Daemyen gained 7th place. Andre and Jake did not medal, but a state berth is quite an achievement. Congratulations, Andre, Jacob, Jake, Daemyen, and Joe! Several of the Oak Park & River Forest freshman and sophomores participated in the IWCOA (Illinois Wrestling Coaches and Officials Association) Frosh/Soph State Tournament. Eligible wrestlers are freshmen and sophomores who did not qualify for the IHSA Individual State Final. Wrestlers on any level (Frosh, JV, or Varsity) who meet this requirement are able to compete at the Regional, Sectional, or State level. These championships were held on March 12-13 at the Prairie Capital Convention Center in Springfield. In all, five Little Huskies competed in the tournament. The five were Torry Early (113), Eddie Ordoñez (138), Davin Colvin (195), Elijah Osit (195), and Ashford Hollis (285). Torry took home the title! Also placing were Elijah (5th) and Davin (8th). Eddie and Ashford gained valuable experience. Congratulations Torry, Eddie, Davin, Elijah, and Ashford! Elevating a number of highly impressive student-athletes from OPRFHS to a plethora of colleges and universities has become a regular occurrence in recent years. At the 2016 NCAA Division I Championships, three former Huskies will represent their current school of higher learning. Sammy Brooks (184 pounds) will wrestle for Iowa. Sammy has a 22-4 season record. Joe Ariola (184 pounds) will wrestle for Buffalo. Joe has a 13-15 season record. Michael Woulfe (197 pounds) will wrestle for Navy. Michael has a 32-12 season record. If you were wondering about Davonte Mahomes, wrestler at Michigan, he has reported that he has had to undergo a second ACL surgery. Undaunted, Davonte commits to relentlessly pursue. 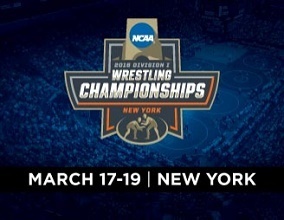 The Division I Championships will take place this Thursday, Friday, and Saturday at Madison Square Garden in New York City. 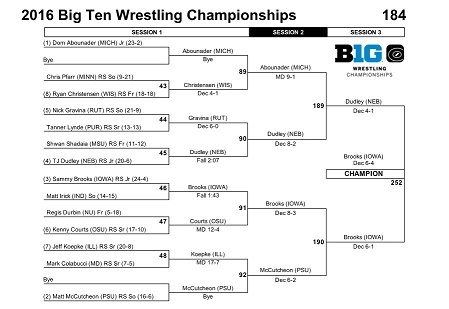 Sam Brooks, a 2012 Oak Park & River Forest graduate, defeated all on-comers en route to the 184-pound Big Ten title at the NCAA Big Ten Wrestling Championships on Sunday. Sam, a redshirt junior, wrestled in front of his home crowd at the University of Iowa. Congratulations, Sammy!